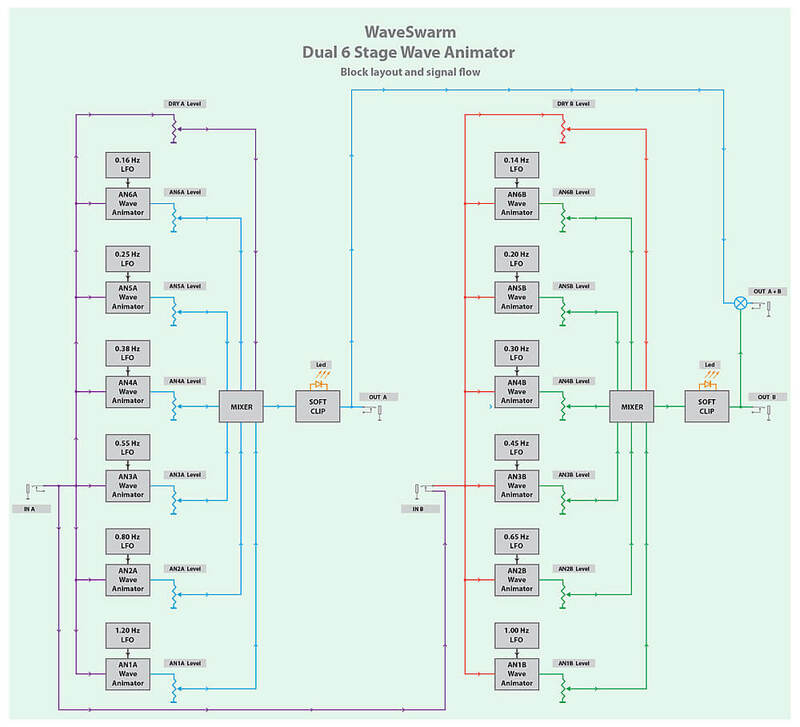 The WaveSwarm is a waveform animator which can take a regular sawtooth or triangle waveform and add "animations" so that it can sound like up to twelve unison VCO's all playing together! Each channel simulates up to six VCO's beating in unison. The fixed beat frequencies are generated by twelve onboard LFO's, and the front panel pots control the level of each of the six animators, along with the level of the dry signal to the final mix. It also has an A+B output, which sums the outputs of the two channels, creating an effect similar to twelve VCO's in unison! Also, channel B uses slightly different beat frequencies to channel A, they are not identical. The WaveSwarm is capable of producing huge, fat drones or supersaw type waveforms from a single sawtooth or triangle wave input. 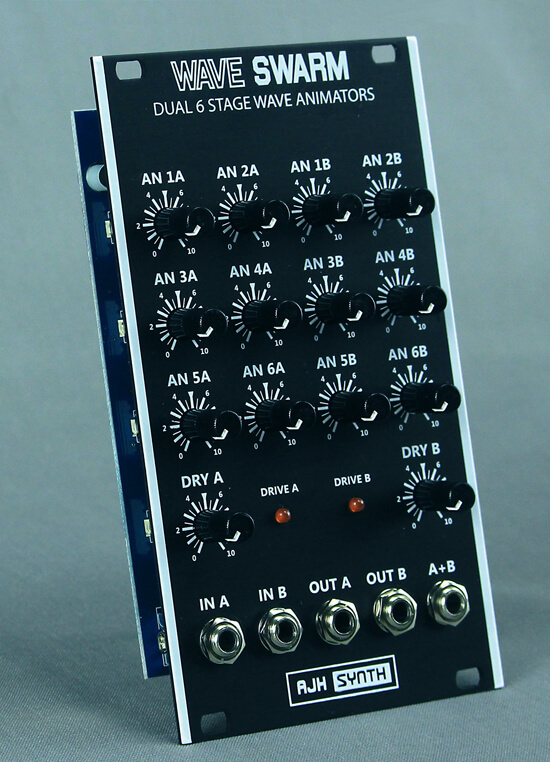 The WaveSwarm ia an all analogue module which emulates the sound of multiple oscillators in unison - so how does it do that? Well, if we listen to s single VCO producing a Sawtooth or Triangle wave it sounds quite flat and uninteresting, however if we adda a second VCO with exactly the same waveform and frequency we get a much fatter sound - but only if they are SLIGHTLY out of tune with one another - if they are EXACTLY the same frequency and in phase then they go back to soundling thinner, like a single VCO. The secret is that when we have a very slight de-tuning of one VCO against the other we get "beating" between them due to heterodyning, the beat frequency is actually the difference in frequency between them. This beating effect generally sounds most satisfying when the beat frequency is between 0.1hz to 1.5Hz. Because of this low frequency "beating" effect the two waveforms are moving in and out of phase with one another at the beat frequency, and producing more complex waveforms as a result, this is because the two waveforms are added and subtracted together in a constantly changing combination, which repeats at the beat frequency and as a result produces a much fatter and more interesting sound. Now, if we add in a third VCO, and slightly detune it against the other two VCO's so that it is running at a different beat frequency, then we create an even more complex and interesting sound, a huge, classic three VCO unison sound. This is exactly the effect that we can achieve with the new WaveSwarm module, and it offers two six stage wave animators, channel A and Channel B. If we look at Channel A in the Block Layout and Signal Flow diagram below it can be seen that we have six individual Wave Animators wired in parallel, and each wave animator is modulated by its own dedicated LFO, all of which are preset to individual, and different, fixed frequencies. We can see that each of the two channels (A and B) comprise six wave animators which are connected in parallel. Each individual animator has its own dedicated, fixed frequency LFO. The individual animators are fed into an audio mixer, so that each has its own level control which can be adjusted to set the levels of each of the six outputs within the overall output mix. The mixer has a seventh input, which allows us to mix the incoming Dry signal with the wave animations. The mixer is followed by a soft clip circuit, with a soft clip incication LED. The A+B output is the sum of both Channel A and Channel B, and as Input A is normalised to Input B this arrangement allows all twelve animators to be used on a single input signal. What does it do and how does it sound? Here's an excellent demo video / review from DivKid Ben that gives the WaveSwarm a thorough workout. How about using twelve AJHSynth MiniMod VCO's feeding into 12 channels of WaveSwarm modules to create the massive sound of 84 VCO's! This incredible setup is being used here by award winning composer, producer and arranger Lester Barnes to re-create the famous THX Deep Note movie intro.. The all analogue WaveSwarm circuit was designed by our good friend Jorg, a creative genius who lives and works from a secret, hidden cave in the Grand Canyon in Arizona. This unmapped network of underground caves are rumoured to have been dug from solid rock centuries ago by a small group of Ancient Egyptians who fled the great Nile flood and crossed the Atlantic Ocean to settle in the US centuries before Columbus. Jorg has many decades of analogue design experience and has been active since the early days of modular synthesisers. Now living completely off grid, he toils endlessly each day indulging in his two favourite persuits; creating new and exciting analogue synthesiser circuits and growing the world's longest beard. Jorg is so old school that despite being heavily involved in the formative years of Silicon Valley he now completely shuns computers and instead insists upon drawing schematics on hand made papyrus, using a thin reed brush dipped in ink. All of his design computations are done by hand, and when he runs out of digits he does his more complex calculations using his trusty old abacus and hieroglyphic look up tables.